People were so angry, they couldn't stay quiet. On Wednesday, the agency said it has no current plans to kill the animals and that it has not yet formally replied to the advisory board's proposal. It will do so at its next meeting, which is set to take place in the next few months. The BLM will "continue its current policy of caring for unadopted or unsold wild horses and burros" and will "not sell or send any animals to slaughter," Tom Gorey, a spokesman for the bureau, said in an email to Reuters. The Humane Society of the United States (HSUS) is counting the announcement as a win for the animals - but is celebrating with caution. "We're very happy to hear that the agency is not currently considering euthanasia or slaughter for these horses and burros, but until there is a written, formal response to the board, we just want people to hold the agency accountable," Gillian Lyons, wild horse and burro program manager for the HSUS, told The Dodo. The HSUS has been urging humane fertility control methods, such as a vaccine, to control the wild horse and burro population, but alleges that the BLM has ignored these recommendations for over 20 years. This is because there's competition for this valuable ranchland. 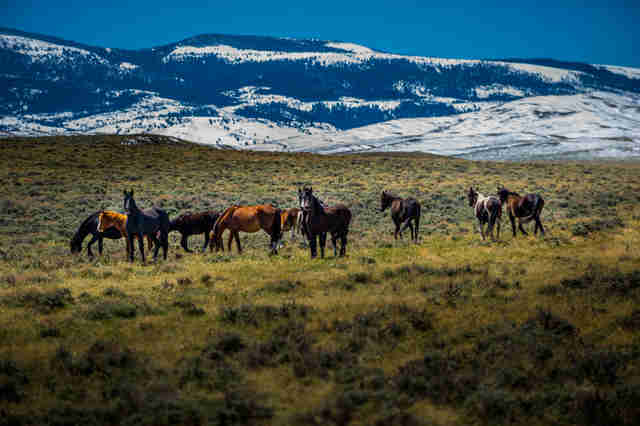 "Under the Department of Interior's 'multiple-use' principles, only so much cattle, so much wildlife, and so many wild horses are allowed on federal lands," Laura Moretti, author of "History of America's Wild Horses. Mestengo. Mustang. Misfit. 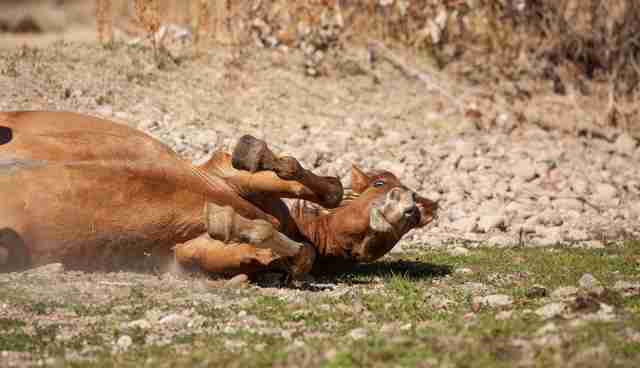 America's Disappearing Wild Horses" wrote. "The wildlife is 'paid for' by hunters' licensing fees. Cattle are 'paid for' by the meat industry: $1.35 per head per month to graze the public domain. Horses, on the other hand, take up one 'Animal Unit Month' (AUM), but no one is paying their way. Each horse removed from the West frees up another AUM for cattle or sheep or game antelope." The BLM has adopted out more than 230,000 wild horses and burros since 1971, and the BLM says that "[m]any of those animals have become excellent pleasure, show, or work horses." But some - at least 1,700 that we know of - end up in the slaughter pipeline, a recent investigative report discovered. The BLM sold horses to a Colorado rancher who in turn sent those horses to Mexico to be killed. The feds have made a mess by rounding up wild horses in the first place. "If there is any 'emergency,' it is one of the BLM's own making," the American Wild Horse Preservation Campaign (AWHPC) said in a statement. "The BLM has failed to adequately reduce or eliminate private livestock grazing despite record drought conditions, and stubbornly refused to implement large-scale humane birth control programs for wild horse and burro population control, as recommended in 2013." A 2013 report by the National Research Council found that "the management strategy of removing free-ranging horses and burros from the range leaves the animals that remain on the range unaffected by density-dependent population processes." The population growth is therefore "not regulated by self-limiting pressures, such as lack of water or forage," the report said. "[T]his allows horse, and possibly burro, populations to grow at an annual rate of 15-20 percent. " Now there are two good options for how to manage the horses the agency has rounded up over the years, according to Lyons. "Knowing what they know, and what they've known for a while, our view is that they made this commitment, they have to care for the horses they've put in holding facilities," Lyons said. "It's costly, but it's their responsibility." Lyons also said that there are areas where the horses have disappeared that could be feasible areas for the horses in holding facilities to be released. "The humane advocacy groups stand ready with this alternative," Lyons said. "The crux of the issue is we just don't want the horses removed from the range anymore." But this fiscal year, the BLM kept with the old method, and still rounded up and removed wild horses and burros even though the study shows that this actually makes the wild population grow. In total, the BLM reports that so far this year, it removed 2,452 horses and burros from the wild, as opposed to just 715 who were treated with birth control and set free. So, while this week's announcement is good news, until there's a promise to ensure the safety of the horses and burros and a viable plan for their future. "The BLM has come to the right decision in rejecting a recommendation for the mass killing of up to 45,000 captured wild horses and burros," the AWHPC said. "However, the public will be watching carefully and will not be fooled." Lyons, likewise, urges everyone to keep their eyes on the BLM. "There's a worry that if we all get quiet right now, they could change their mind," Lyons said. The Dodo will continue to follow this story as the BLM responds to the board's recommendation. Click here or here to add your name to petitions on this issue. Click here to learn how you can get involved in preserving America's wild horses. Click here to donate to HSUS's Wildlife Protection Campaign.